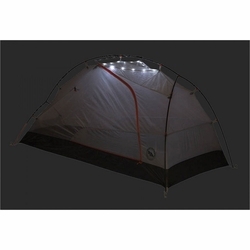 Big Agnes Copper Spur HV UL1 mtnGLO Tent. These full-featured, ultralight backpacking shelters are super easy to pack, setup, and inhabit. Dual doors make entry and exit convenient for all, and the award-winning mtnGLO Tent Light Technology makes overnights with friends and four-legged partners better than ever. With steep, vertical walls there’s enough internal space to ensure that windy, rainy afternoons spent playing Hearts won’t leave you feeling claustrophobic. Packed Size	4" x 16.5"